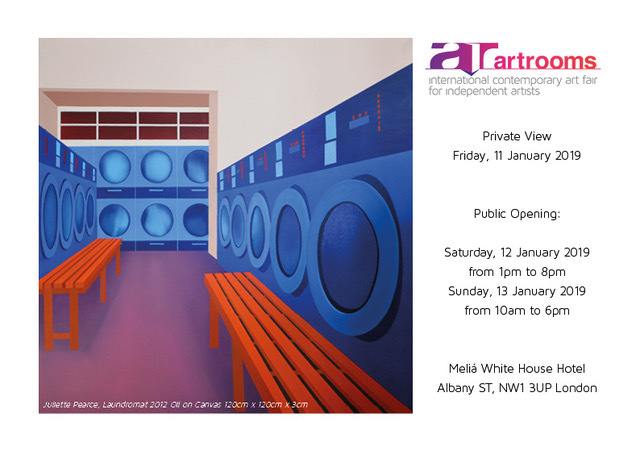 After the success in Rome and in Seoul, the Fair is ready to open the doors of the 5th Edition of the Artrooms Fair London, set at the Meliá White House, in Regent’s Park from the 11th to the 13th January 2019. Globally renewed as the First Contemporary Art Fair offering artists free exhibition spaces, Artrooms Fair presents an interesting diversity of works, with more than 100 exhibitors from 30 countries across 5 different continents. The quality of the fair is guaranteed by a Committee of experts such as Giulia Abate, Cristian Contini and Stefania Minutaglio, gallery directors respectively art Mucciaccia Contemporary, Contini Contemporary and 11[HellHeaven], collectors Claudia and Rainer WenteWaedlich, just to name few. In the unique setting of hotel rooms transformed by the artists in their intimate studios, the Fair is a hot pot for galleries and curators to scout for the next big stars. Collectors and Art lovers will have the opportunity to acquire works among different of media such as the wonderful oils on canvas by emerging artist Juliette Pearce, whose work "Laundromat" has been chosen as the main images of the fair, and the installations curated by Sebastian Chaumeton "Doodle", student at the UAL and "Matrix" by Alice Padovani, an award-winning Italian artist presented in the Guest Artists section. The fair also offers important prizes, such as those awarded by the Contemporary Art Trust and the FonderiaArtisticaVersiliese. Along the exhibition, the programme is fulfilled with a series of events: art critic Michael Barnett is back with "In Bed with the Artist”, laughs and confessions in between the sheets.